Tuesday afternoons - regular weekly classes. All materials and equipment included, plus paper at a small charge. 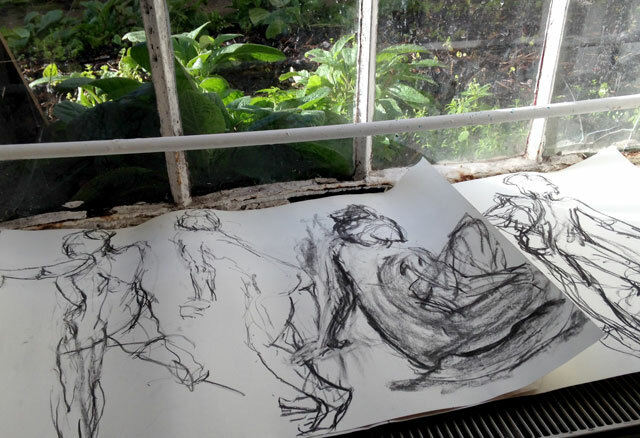 Three intensive days of drawing from the model, providing an excellent grounding in life drawing for beginners or an opportunity to consolidate and move forward for experienced drawers. Drawing is a skill that can be learned, not a mysterious ability bestowed at random. We will use a lot of exercises and games that are proven to increase the eye-hand connection and your way of perceiving your chosen object of drawing. There will be a variety of lengths of poses ranging from short and dynamic to longer poses allowing students to expand into painting in a variety of media. You can attend one, two or three days. A wide range of materials included, plus paper at a small charge. Regular weekly classes, Tuesdays, 2-4.30. This class is suitable for all abilities and provides a friendly environment which supports and encourages absolute beginners, creatively challenges those who want to improve their drawing and gives a framework for artists who want to further their creative practice. Individual attention is given to assess each student's needs and provide them with the appropriate level of instruction. I use a range of exercises and games designed to develop eye to hand coordination and enhance the process of seeing. Tuition also includes some information on anatomy. Bath Artists' Studios is equipped with a full size replica of a human skeleton. Over the term there is a variety of models and different lengths of poses ranging from 5 minutes or less to an hour or hour and a half. Sometimes poses may be returned to over two or more weeks. You can join the class at any time during the term and pay pro-rata for the rest of the term. Most Saturday workshops include an opportunity to paint the figure in more depth. I encourage the use of a wide range of media, singly and together in experimental approaches. I can provide some materials, (except for canvas or board), but please do feel free to bring your own. This workshop looks at ways of drawing the model's head. Whilst not a portrait class as such, we will discover the structures underlying the face which govern the placing of the features. Relative proportions of the facial features to the whole head, and placing on the neck and shoulders, are all important steps towards obtaining a likeness, although obtaining a likeness of the person will not be our primary goal. All drawing media will be explored, including some colour. Some materials are provided, but you are welcome to bring your own. Felicity Bowers taught life drawing and illustration at City of Bath College from 1998 to 2006 and at a number of other schools and universities over the last 30 years. She completed a masters degree specialising in fine art printmaking at University of the West of England. She has also taught drawing and printmaking for University of Bath's ICIA. She has taught regular classes at Bath Artists' Studios since 2006, where she also has a studio. A limited number of places will be available for individual sessions in all courses, but must be arranged with me in advance. Cost - £18 per class. Unfortunately no concessionary places are available. Payment by installments and pro-rata arrangements can be agreed for individual students.